plusoptic compatible 100g, qsfp28, 850nm, 100m transceiver, mtp/mpo connector for mmf the plusoptic plusoptic compatible qsfp28-100g-sr-plu has a data rate of 100g and a range of 100m on mmf utilising an mtp/mpo connector. as with all plusoptic products, the qsfp28-100g-sr-plu is manufactured in state of the art, iso 9001, dirt and dust free manufacturing facilities. we ensure that all plusoptic products are made with only the highest quality lasers and componentry, under strict manufacturing practices and rigorous testing to ensure that all plusoptic products are of the highest possible quality. 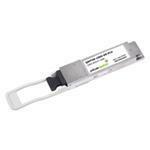 the qsfp28-100g-sr-plu has a full 3 year warranty and a 100% compatibility guarantee. if you require fibre patch leads to connect your qsfp28-100g-sr-plu simply browse through the cables section on our website.